The perfect holiday cheesecake recipe. Mini eggnog flavored cheesecakes with a chocolate crust, topped off with fresh sweetened whipped cream and strawberry Santa hats. An adorable addition to any holiday party. It’s officially December. How did that happen? Did you get that memo? I think mine got lost in the mail or maybe sent to spam… or tossed in the recycling bin. I’m kind of in shock about it. We’ve obviously been prepping for this for months, given that stores like Target thrusted it at us even well before Halloween! I’ll admit, I had my usual ‘oh come on‘! annoyance over it but at the same time I kind of got the teensiest bit giddy over it all too. So, I don’t totally mind that it’s already December. I’m excited in a way. It’s something new to think about but I swear it’s already screaming by and it’s only just begun. Woooah settle down there, right? But no, seriously. I mean just think, it was seriously just 1999. Or something like that. And here it is, December… the Eve of 2014. I can’t even. I don’t want to think about it. So okay, our tree is up and we’ve already been having Christmas movie marathons. Is your tree up yet? I swear that’s what my Instagram feed was full of this weekend – lots and lots of people setting up their trees and other holiday decorations. And holiday baking music is in full effect … much to the Mr’s dismay. He isn’t exactly a fan of the same songs over and over just with slight variations by different people. I can totally get into it though. The kids are of course excited about Christmas and Santa so it seemed fitting to kick off a month of sweet tooth adventures with an adorable and totally festive treat. Right?! No tiptoeing in. It’s time to jump in and get cozy! You know how completely obsessed I am with mini things, especially mini cheesecakes. If you hadn’t noticed, it’s time to catch up. Go ahead, take a peak (HERE) and see what you’ve been missing. 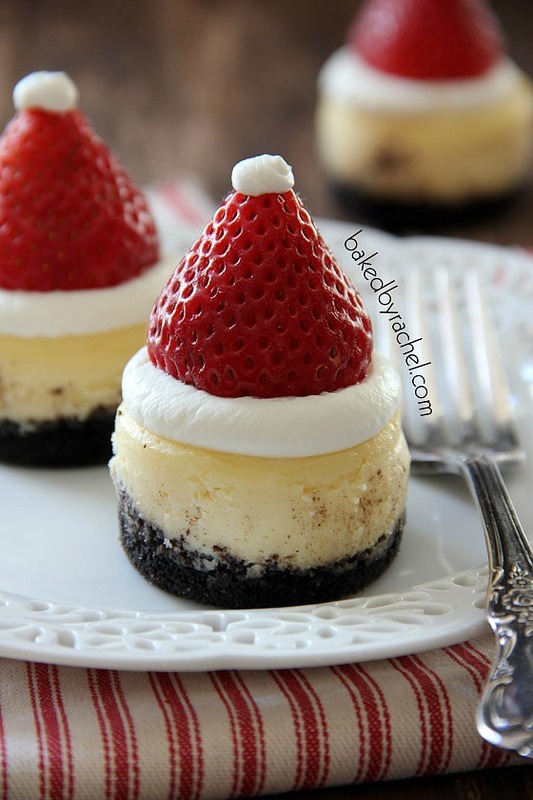 Who could resist a super cute Santa hat cheesecake? It’d be the hit of your holiday party with both adults and kids! Take it a step further and give it a dusting of sugar for the ultimate touch. I really wanted to call these “snow dusted Santa hat cheesecakes” but I thought that was a bit long so… mini Santa hat cheesecakes it is. Creamy mini eggnog cheesecakes sit on top of chocolate crusts. Homemade sweetened whipped cream and fresh strawberries create the perfect Santa hat, with a finishing touch of powdered sugar for the snow. These are an absolute must make this holiday season! Mini eggnog flavored cheesecakes with chocolate crust, topped off with fresh sweetened whipped cream and strawberry Santa hats. Preheat oven to 350°F. Lightly grease a mini cheesecake pan. In a food processor, blend cookies until only fine crumbs remain. Combine crumbs with butter and sugar. Divide between prepared cheesecake cavities, adding 1 small cookie scoop of crust mixture to each cavity. Press down firmly to create an even layer. Bake for 5 minutes. In a large bowl or stand mixer beat together cream cheese and granulated sugar until fluffy and smooth. With mixer running on low, slowly add eggnog, flour, vanilla and salt. Gradually increase speed, mixing until no lumps remain. Finally, add egg, mixing until combined and no streaks remain. Divide batter between cheesecake pan cavities using a medium scoop. Add roughly 1 and 1/4 medium scoop or a heaping scoop to each cavity. Bake for 15-18 minutes or until cheesecakes are set. Allow cheesecakes to sit in pan on a wire rack until they are room temperature. Transfer cheesecakes to refrigerator to chill overnight or until chilled through. In a medium bowl, beat together heavy cream and powdered sugar until stiff peaks form. Cover and chill until ready to use. Carefully remove cheesecakes from pan, removing the pan disc from the crust. 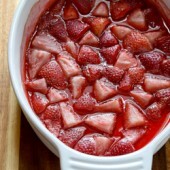 Top off with whipped cream and strawberries. Sprinkle with optional powdered for a snow dusted look. *For the crust, use 10 whole Oreo cookies minus the cream filling (or 20 chocolate cookies, no filling). I’m always taunting you with mini cheesecakes so I thought it’d be fun to do a giveaway for my absolute favorite mini cheesecake pan. All opinions are my own and I haven’t been endorsed in the slightest way to show you this. I just really truly love it. It makes for some seriously fun and cute desserts and I want you to have one too! If you make cheesecakes, you know how important having a removable bottom is, right? This pan has 12 cavities with removable bottoms! And the entire pan is non-stick, which as you know, helps a lot with baking finicky desserts at times. Courtesy of Baked by Rachel (aka me! ), one reader will win one mini cheesecake pan. Giveaway will run from December 2, 2013 – December 7, 2013. Winner must be at least 18 years old and a US resident. Winner will be randomly selected and emailed. Winner has 48 hours to respond or another winner will be chosen. Main entry must be completed or extra entries will not count. Thanks!! :) I can’t wait to see your tree fully lit and decorated lol I’ve only seen the bottom tier so far. Weird! Do you have a fever?! lol ;) And thank you for sharing this everywhere! So stinkin adorable. I love your “mini” obsession… you are the best at it!!! There’s just something extra fun about mini food. It’s definitely an obsession lol :) And thank you! These are so adorable, I can’t stand it! Love this idea, very creative. And yummy, also. 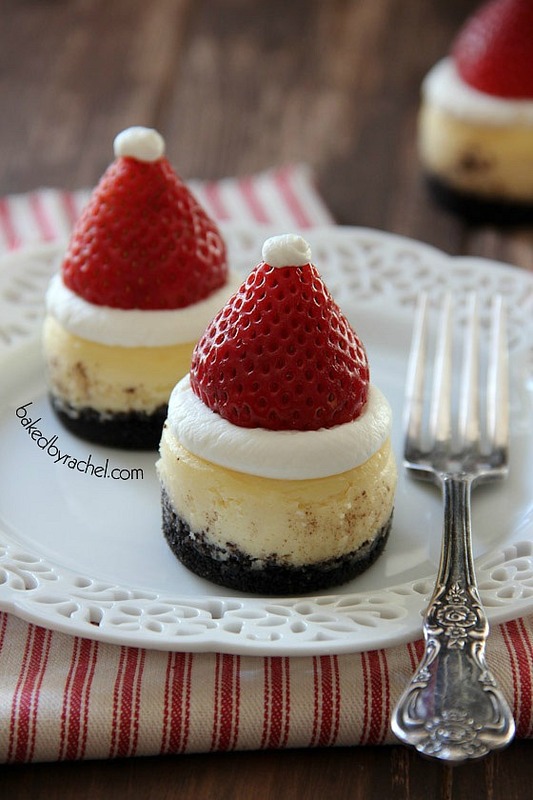 Not entering the giveaway Rachel just have to say how cute these mini Santa hat cheesecakes are. Mini Bailey’s Cheesecakes sound like a winner, but I will also make the Santa hat ones for giving to friends. They are just TOO cute. 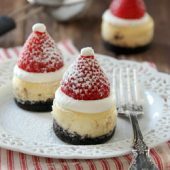 I love the idea of all of your “mini” recipes; however, I am most excited about to try out this one (mini santa hat cheesecakes). 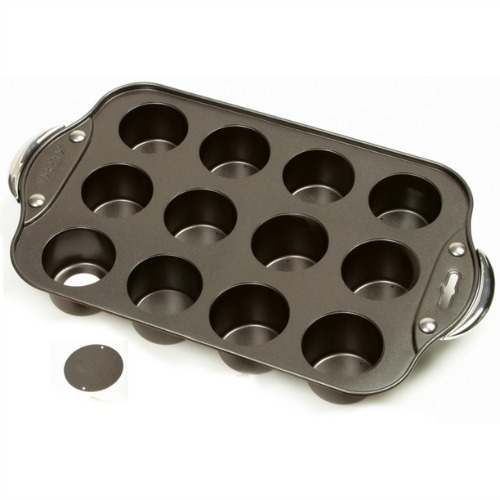 Might just have to go out and buy me a mini cheesecake pan… unless I win one!!! 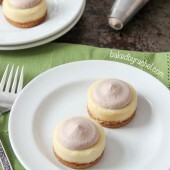 I’m most excited to try the mini eggnog cheesecakes recipe! I like Baked by Rachel on Facebook! I’m so excited to try these mini Santa cheesecakes! THey are so stinkin’ cute and just right for the family get together! …and I’m a pintrest follower! I don’t have Instagram or Twitter because I don’t have ANY idea how they work, but if I did, I would! Does that count? This one for sure, so adorable! I LOVE all the mini cheesecakes! My fave are the red velvet. I can’t wait to try those! These Santa hats could not be cuter though too!! I would love to try the pumpkin cheesecake and then the red velvet. I follow Baked by Rachel on Pinterest (all boards)! I follow Baked by Rachel on Facebook. 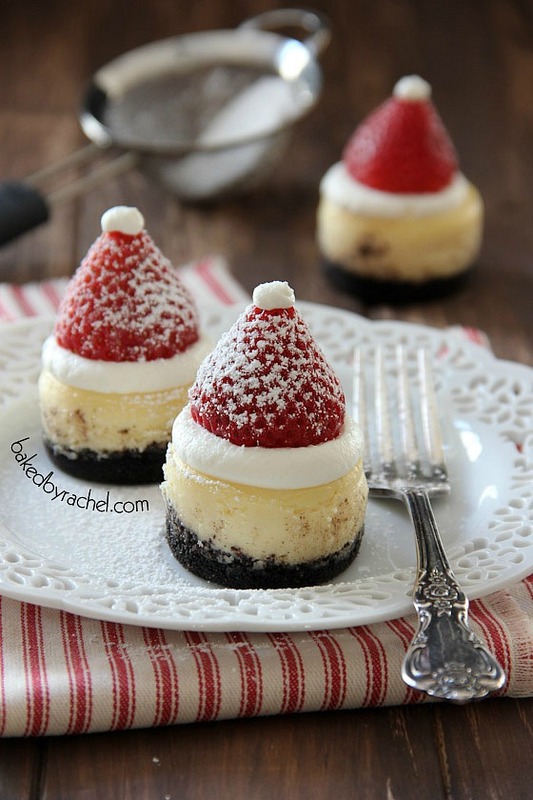 If I win the minicheesecakepan, these cute and delicious looking Santahat mini cheesecakes! I subscribe to Baked by Rachel e-mails. I can’t even handle the cuteness :) Seriously loving these little guys! We’re decorating our tree today! Thanks Katrina! :) Make sure you share a pic of your tree once it’s done! I follow Baked by Rachel on Instagram! I follow Baked by Rachel on Twitter! I subscribe to your feed via email (subscription is activated)! i pinned! apparently it won’t let me paste my url though -_- so i’ll have to type it out. I want to make these soooo bad but I need to win the pan to do it! Soooo cute! 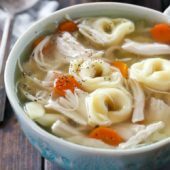 I follow you on Pinterest and I pinned this recipe post. White Chocolate Peppermint Bark Cheesecake Please & Thank You! These look delicious. I will definitely give these a try with the kids this holiday season. Thanks for the recipe! I would love to make the apple cheesecake mini with brown butter.